« Physics Needs Strong Philosophy More Than Ever: Scandal of the 5%! Biased Leading Questions Can Be Worse Than Outright Lies. False Contexts Are The Worst. Are the French the primary cause for the two World Wars by having awakened German nationalism after annexing Lorraine, Alsace, and the Napoleonic wars? As this was a question which naturally arose to those who know a modicum of history… The question is criminal because it is, implicitly, holocaust denying. This indeed is the sort of leading question a Nazi would ask. Actually the Nazis asked that question, and answered it their way, the same way as in the question above. Nazis thought, and said, that the Jews and the French caused World War Two (so don’t blame us for Auschwitz, the French did it…) Many English readers, following Barbara Tuchman and her ilk, believe, as it is asserted in lying versions of history, that blame has to be spread around for the launch of World War One. Actually, that’s completely false: the German Second Reich attacked (with the hidden support of racist President Wilson of the USA). The attack was so carefully planned that that misleading details were carefully included. The German emperor was sent in vacation incommunicado, for the whole world to see, to instill a festive mood of holidays as usual, a false sense of security, among the future victims (France, Russia, Britain, Belgium, Luxembourg). The idea was that, if the commander-in-chief, the Kaiser was solidly vacationing, he certainly was not planning war. Meanwhile, the German High Command prepared for full mobilization as fast as possible, and full attack, concentrating the entire army onto france. And it is of course not true that plain German nationalism was the main engine of the two world wars: Why would German nationalists risk destroying Germany? Instead there were other engines in the German motivation to savagely attack the world twice: the hatred-against-everybody (French, Slavs, Jews, Danes, Norwegians, British, Russians, etc.) was a solution of the German plutocratic elite to deflect legitimate anger of the German people against the oligarchy towards convenient scapegoats, prepared to take all the blame… That hatred of the French, the Jews, the Poles, the Russians, the Slavs, etc., generalized as a hatred for Human Rights, 1789 style: as demonstrated by the deliberate genocide of the Natives in Africa by the German military. Especially in Namibia. German nationalism was created deliberately by Prussia, as a cementing mood in the 18th Century (and it also brought income as the Jews were specially taxed). Prussian nationalism involved solid hatred against Jews, Poles, Austrians, and, soon enough, the French (initially France was the model the Prussian leaders followed, especially king Frederik the Great, though…) It enabled Prussia to seize the wealthy, mineral rich Silesia (grabbed from Austria-Hungary, in a succession of wars) and more than double its territory. The natural border of Gaul ought to be, as under Caesar, on the Rhine. Germania was, in Roman times, naturally, on the other side of that mighty river. The Francia of the Franks itself extended, for centuries, to Eastern Europe. So Lorraine (from Lothar), Alsace? Details. Countries such as Belgium were fabricated to weaken France. The Netherlands itself, a country France created, turned against its creator because of the dictator Louis XIV, and conquered England to use the latter as a weapon against France…. All these wars were caused by the lack of the minimum unification necessary to establish peace throughout Europe. Thus, naturally Europe should be one confederation, a giant Switzerland… Brexit is the wrong turn there, and should be severely punished… Brexit is actually the wrong mood: Britain had to stay inside and fix the system from inside. Francia Occidentalis, later known simply as the kingdom of France made that same exact mistake in the Tenth Century: the Western Franks excluded themselves from the rest of Francia, just as Britain is excluding itself from the rest of Europe. The Western French spurning of Europe brought 10 centuries of wars. 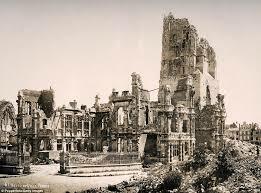 Many Middle Age most magnificent buildings were destroyed by the German invasion of 1914. In particular the tallest castle was destroyed (still is). Deliberately in Fall 1918. 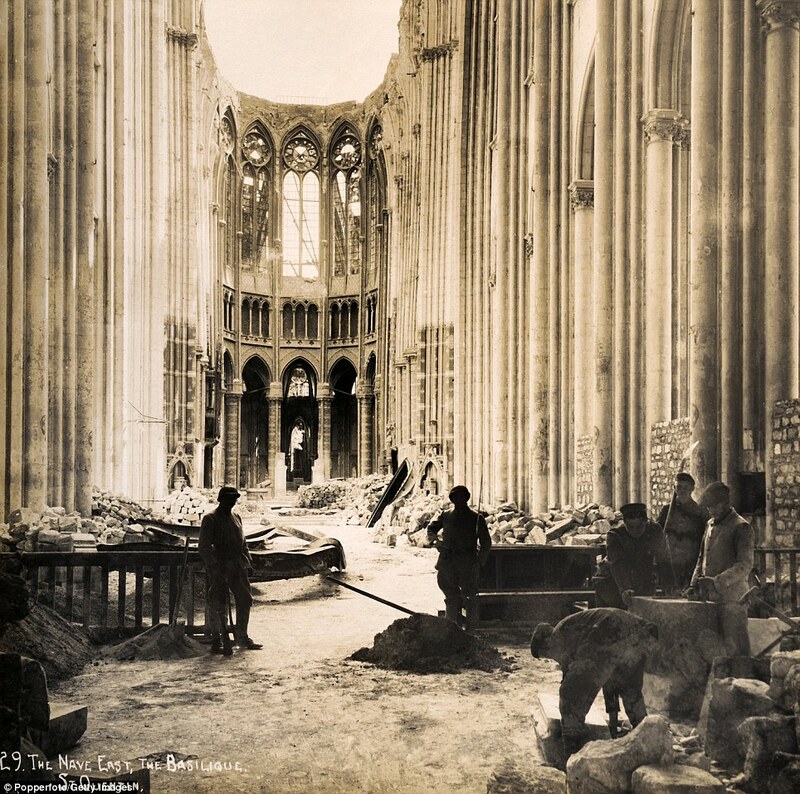 Here the Saint Quentin Basilique being rebuilt in 1919. One talk a lot about fake news. Worse are outright lies. But the example above (and Quora is full of them) shows that leading questions which posit the wrong mood introduce erroneous contexts. Contexts are local logos, local logics, neural networks in AI parlance. They are full of axioms, theorems, corollaries… Refuting one theorem, changes nothing, if one doesn’t refute the axioms. Because any theorem is a consequence of the axioms. So an individual may concede a point out of politeness, politics, convenience, bad faith, craftiness, influence of the moment. But, if they don’t refute the axioms, nothing will change. Only refuting the contexts they are the foundations of, can change the moods. A nonlinear task. You want to change the world for the better? Change the contexts, and change the systems of thought. From outrageously false to as good as one can make them. Better moods will follow, and sustain the whole enterprise of truth. And what’s beauty? Beauty is truth, that is, nature. And more beauty is more nature, more truth. Nazism was ugly, in great part because it was a lie. Nazism was a factory of the most grotesque lies. So let’s quit the habit, that is, the crap. Note on the irrational mood of condemning Islamophobia: The Qur’an has 124 verses of tolerance, but even more of various horrors (for example, homosexuals are to get the same treatment as in the Bible, a “rain of stones”, and “apostates” those deemed to have stopped believing in Islam are to be killed). 2.190. Fight against those who fight against you in the way of Allah, but do not transgress, for Allah does not love transgressors. 2.191. Kill them whenever you confront them and drive them out from where they drove you out. (For though killing is sinful) wrongful persecution is even worse than killing. Do not fight against them near the Holy Mosque unless they fight against you; but if they fight against you kill them, for that is the reward of unbelievers. 2.192. Then if they desist, know well that Allah is Ever-Forgiving, Most Compassionate. 2.193. Keep on fighting against them until mischief ends and the way prescribed by Allah prevails. But if they desist, then know that hostility is only against the wrong-doers. All too many statements, axioms of the Qur’an are about killing. “Unbelievers”. Clearly, those not embracing it, should fear such a religion. But, guess what? Those who condemn Islamophobia as “racism” have not read the Qur’an (or then special versions where all the violence was edited away). In other words, they hold an idea, a mood, but not what piece of reality (lethal threats are fundamental axioms of the Qur’an, of Islam, then). Deficit Obsession, an example of false context: The European Union, like the French Republic in the 1930s, has decided that government budgets should be balanced. It’s not clear if this is a theorem (consequence of higher principles) or an axiom (something out of the EU Qur’an). The practical consequence has been that fundamental economic functions found themselves without money, and degenerated. This entry was posted on October 7, 2018 at 9:44 pm and is filed under Context, Wisdom, World War One, World War Two. You can follow any responses to this entry through the RSS 2.0 feed. You can skip to the end and leave a response. Pinging is currently not allowed. A lot of the most famous books, system of ideas, and moods got well established after their author’s death. Exceptions are revealing: some are in Aristotle’s style. Aristotle was part of the Macedonian oligarchy which put an end to independent Greek city states and Athenian democracy. So he was a star among stars, still is… which is revealing about our “democracy”. Some, more like Montaigne. Montaigne was a Lord, mayor of Bordeaux, close to Henri IV. Not just that, but he read to Marguerite de valois, queen of France and Navarre prototypes of his essays. She discussed them with him, encouraged him, and later would herself write one of the early feminist books. What do these example mean? We are, we were prisoner of the star system. All along. Goes both ways: the Christians went to great lengths to destroy all work on atomic theory. All books of Epicurus, 300 of them, destroyed. Contexts are everything. They are entangled with myths and axioms and moods. In my opinion both physics and math suffer from glaring mistake in basic axiomatics. Both erroneous axiomatics have to do with the erroneous idea of infinity, and the errors overlap. Plato was at odds with democracy too – until democracy got at him. The trouble with “democracy” is, as then, it ends up with a couple of oligarchs in charge. O agree Poincare is badly under-rated, but then so are Lorentz and Fitzgerald. And an awful lot of others. The core question seems supremely contemporary: French oppression of the German lebensraum simply must have been the cause of German aggression. France was the oppressor and thus evil. Such is the limit of pseudo-liberal morality. Outrageous! When we abandon a commitment to real liberalism – a full-throated defence of the individual and rationalism and secularism – in favour pseudo-liberalism (I wish I had a better word for this) we surrender to the authoritarian, the plutocratic, the corrupt. I wholeheartedly agree with you suggestion that the EU should be a giant confederation, Swiss-style. At the same time, I see that the EU, as currently manifested, doesn’t contain the means to reform itself to this end. As it is aspirationally autocratic, its legislature doesn’t reflect parliamentary norms. There is no “government” and no “opposition” to challenge it. Repeal and replace is the solution. I’m less certain on Britain’s involvement in the EU, reformed or otherwise. There’s an echo in how France should consider itself and its history this week, Columbus Day in the United States. One cannot doubt Columbus’ sins – but are we to forget his achievements? And the achievements that were to follow because of them? Are we to say that the world would be a better place if the United States had never come into existence? Or France? Of course not, but you’ll find many who say otherwise. Civilization itself is under attack. And there is a dark age ahead.